Enjoy this beautiful, newly remodeled townhome/apartment that is walking distance to the local businesses, Lake Superior, and activities in the downtown area. Welcome to Cascade Cornerstone East. Make this vacation rental your home away from home. This place can sleep up to four people and it is perfect for longer stays. Gas fireplace perfect for those cold nights on the North Shore. Grab a blanket and enjoy a cup of hot cocoa by the fireplace. The kitchen is open to the living and dining area and has all the supplies you need to make home-meals Modern kitchen with space to keep everything organized. Dining room table has seating for up to 6 people. Enjoy a TV night with your friends and family. The sun room is located off the living room area and the main bedroom, and has access to the balcony. A balcony with a beautiful view is one of the highlights of this home. The bathroom is located on the main floor and has double sink and plenty of space for you to get ready in the morning. Bathroom also features a walk-in shower. The main bedroom is located on the main level and features a queen bed. It has access to the living and sun room. A closet and a dresser to make plenty of room to unpack your things. View of the living area from the upper level. The second bedroom has a wonderful view of the downtown area. It features a comfortable queen bed. A dresser and a desk to store your clothing and electronics. Enjoy a nice breakfast on this rooftop balcony located off of the second bedroom in the upper level. Cascade Cornerstone is located in the old Norshor Building and is close to many businesses and activities in town. Stay at Cascade Cornerstone East and experience the best of Grand Marais. If you are looking for a long-term vacation rental in Grand Marais, look no further than this beautifully remodeled and professionally decorated apartment, located in the old "Norshor Building". The building is rich in Grand Marais history and centrally located within this quaint, picturesque Lake Superior town. What once was the original Johnson's Food grocery store now hosts a few local businesses, long-term visitors, and long-term residents. You will find yourself right in the heart of Grand Marais in what we are now calling "The Cascade Cornerstone Building". The apartment has new everything! 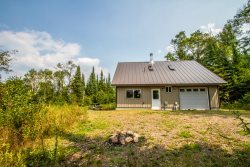 Torn down to the studs and rebuilt in 2016 it is now available for you to rent during your next long-term vacation to Lake Superior's North Shore. You will love the open layout living area with a gas fireplace and stainless steel appliances in the kitchen. The apartment features all of the amenities you need to make this place your home. A large flat-screen TV with satellite is great for movie night after a day of hiking and exploring the North Shore. You will also be able to stay connected with Wi-Fi service. Two outdoor areas allow you to enjoy the scenic views of Lake Superior and the Grand Marais Harbor. All new beds and furnishings top off this immaculate apartment. With two spacious bedrooms, taking up 2-stories on the upper level of the building, this apartment can accommodate up to 4 guests. Comfortable queen size beds are in each bedroom, as well as enough space for you to unpack and organize your things, just like if you were at home! And, if you don't bring enough clothes along, we have a washer and dryer in the common area. Located just walking distance to the Grand Marais downtown area and harbor, many local businesses and the best part: activities around town. No need to worry about where to park during busy holiday weekends. Just take a stroll downtown from your own luxury apartment. A minimum 30-night stay is required and the price listed reflects stays of 30-days. Want to stay longer? Contact us for special pricing for 2 or more months. To make a reservation, or get a special price quote, you must contact a rental agent at (218) 663-7971.